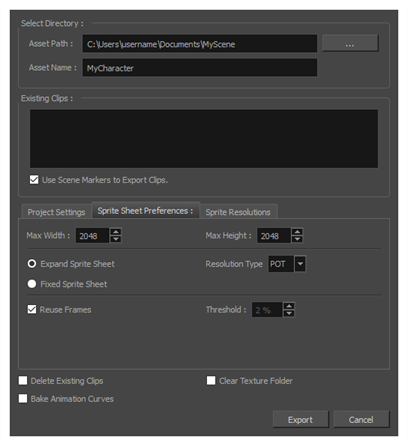 If you created the different animation clips in the same scene and separated with scene markers, all you need to do is open the Export to Sprite Sheet dialog and export your sprite sheet and animations once. However, if you separated your animation clips by saving them in different scene versions, you will need to start by exporting the sprite sheet from your base scene, then open each scene version and export their animation clip one by one. Under Existing Clips, make sure the Use Scene Markers to Export Clips option is checked. Harmony will export the sprite sheet for your rig and the animation for all of the clips in your scene.